The proceedings of the third day at the Itikaf City of Minhaj-ul-Quran International, presently underway in Jamia al-Minhaj Lahore (Pakistan), began with the Dhikr and offering of Durood and salutation on the Holy Prophet (S.A.W) followed by Fajr prayers. Since majority of the participants of the Itikaf attended the Mahfil-e-Zikr and Naat organized by Mustafavi Students Movement, they were already awake, The spiritual programme ended on the Quranic recitation and Naat by renowned Qari Karamat Ali Naeemi, who mesmerized the Itikaf City with his characteristic spell-binding voice. Noted Qurra and Naat Khawans of the country participated in the Mahfil-e-Naat. Nazim-e-Ala Dr Raheeq Ahmad Abbasi and the office bearers of MSM attended the programme. On September 14, the speech of Shaykh-ul-Islam Dr Muhammad Tahir-ul-Qadri started at 11 a.m. but the hall had already become full of people before the start of his speech. 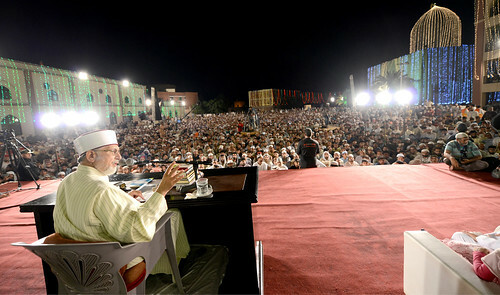 Shaykh-ul-Islam Dr Muhammad Tahir-ul-Qadri resumed his speech on the topic of ‘Retreat’. He said that Imam Abu al-Qasim has written in his Journal ‘Risala al- Qushayria’ that the inception of the retreat is that man avoids meeting people and mixing up with them freely. The height or end-point of retreat is that he strengthens his relationship with Allah Almighty so firmly that even if he sits among people but still he is not away from Him. When a man loves someone, it becomes difficult for him to sit in isolation. He told that the when the love of man for his Lord becomes solid, no difference is left between his company and retreat because he leaves ‘Maqam-e-Tafrika’ for ‘Maqam-e-Jamaa’. Referring to Imam Abu al-Qasim, he said that the former wrote that the intention of man should be that he was adopting retreat not to keep himself safe from the evil of the people but to keep them safe from his evil. He said that man should imbibe this thought that he decided to adopt retreat to prevent the dog of his ill-commanding self from bit in the people. With this though would come tremendous change in man. He said that someone asked Imam Abu al-Qasim al-Qushayri as to who was ‘Arif’? He replied that he was such a person who lived among the people but his heart and mind were beholden to his Lord. He said that what retreat meant was that man should share all activities of life with his fellow human beings like eating and living etc but his heart should remain imbued with the remembrance of Allah. Shaykh-ul-Islam further said that retreat transforms man from inside and he gets the chance to review and reform his morals. But the underlying intention behind the adoption of retreat should be to get the nearness of Allah Almighty. It should not be motivated by any worldly demand or greed. He said that one attains the perfection of real retreat when one is living among the people but his heart is detached from them and their worldly pursuits. Retreat can neither bear fruit nor can prayers be granted as long as one does not earn the lawful livelihood. No sustenance can be lawful as long as one is not on good terms with the people. Shaykh-ul-Islam said that if man got three things, his retreat would be accepted. Those three things are that man makes retreat his company and his hunger should be his food. Hunger does not merely denote the absence of food intake. Rather it is to dissuade one’s ill-commanding self from feeding on all physical luxuries. Thirdly, his supplications become his everyday speech. Whosoever implemented these three things, he would get the real retreat. Shaykh-ul-Islam illustrated the concept of retreat with examples from the life of disciples of Companions (Ta’ baeen). He said that such was the state of retreat of Imam Hassan Basri (ra) that he said: “My days and nights are spent in paying my gratitude to Allah for his blessings.” Imam Ghazali reports Hazrat Owais Qarni (ra) that there were eight disciples of Companions who worked hard in retreat and piety over and above all that if their names were used as a means of intermediation, the patients got cured. He said that Hazrat Ayaz once commented: “When nigh prevails, it becomes the cause of my happiness because now I would talk to my Lord in darkness of night in retreat. When the night dies out, I become unwell and my heart becomes sad because I would have interaction with people again during the day. Shaykh-ul-Islam said that they were those people whose retreat stayed intact even in the company. Shaykh-ul-Islam said that today we were victim to mutual disputes and fights over pomp and show. We think that we contributed to the cause of religion but someone else took the credit and this thing saddens us. He told that it makes little difference whether one’s name is let known or not. Allah knows everyone who worked for Him. Dr Muhammad Tahir-ul-Qadri said that whatever one does in this world in the form of pious deed or act, he should do it without any greed or in expectation of any reward. Allah Almighty would ask His subject as to what he brought for Him. He would say that he worshipped his Lord through prayer. Allah would say that you offered prayer to steer clear of the torment of the hell. ‘What have you brought for Me,” He would say. To a mention of fasting, Hajj, Zakat and other pious deeds, He would say that he (man) performed these worships to earn a place in paradise. What have you brought for Me,” He would insist. Shaykh-ul-Islam Dr Muhammad Tahir-ul-Qadri said that the Prophets adopted retreat. Hazrat Musa (AS) also prayed for retreat and Allah Almighty said to him: O Musa, We granted your prayer. The participants recited collective ‘Wazaif’ mentioned and allowed by Shaykh-ul-Islam. Tanvir Ahmad Khan delivered a lecture on the topic of “Demands of Invitation of faith” in MSM’s Students Leadership Training Programme from 9 am. to 10 a.m.
Dr Raheeq Ahmad Abbasi gave briefing before the start of speech of Shaykh-ul-Islam. The speech of Shaykh-ul-Islam ended at 1:30 pm. Between 2 pm to 3 pm, Prof Muhammad Rafique Sayal delivered a lecture on “How can the working of welfare and educational institutions under MQI be improved”. From 3 pm to 3:30 pm, Dr Tanvir Azam Sandhu, Director of Training, addressed the training session of office holders on the topic of “Future targets of training and strategy”. Training sessions were held as per routine between 4 pm to 5:30 pm. The participants undertook ‘Wazaif’ of Durood before fast-breaking. Mahfil-e-Naat was held after Isha and Traveh prayers.